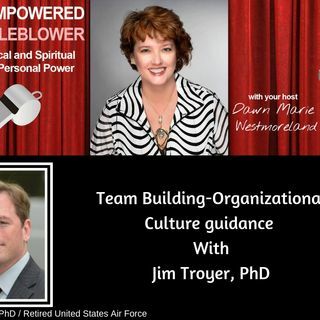 Jim Troyer, PhD understands the dynamics of people and the work culture. He really "gets it". Listen in as we discuss the complexities of personalities and how we can all support each other to have happier and healthier work cultures. "I provide value by helping CEOs make sense of human behavior and providing solutions. These solutions promote employees to get along with one another; as ... See More a result, the business gets ahead of its competition/vision/mission. I help my clients by powerfully and fearlessly coaching them to their dreams. I ask questions no one else has or will ask, and challenge the assumptions and deceit we all tell ourselves. The success that has gotten my clients to their current level is what continues to get in their way. I eliminate these barriers. I only work with committed, powerful, high impact clients who have the witheral to face their biggest fears head-on, take on the temporary pain, then heal and grow. If you fit this mold and wish to get past your current level or plateau, I invite you to call or email me (cjamestroyer@gmail.com; 251 509-6626). I will give you my time to determine whether or not I can help you achieve your dreams".